There are days when we wake up craving those huge, greasy paranthas served with dollops of white butter; the kind you get at the dhabas lining the highway outside the city. We’re listing our fave meal destinations for you; for the days you feel like cruisin’ and wolfing down plates and plates of deliciousness. This is the place to head to to try the famous Rajasthani mava naan. They have two seating arrangements—one just off the road and one behind, which is known as The Garden. A vegetarian only place, the paneer butter masala is easily the star dish here. Pair it with missi roti for the perfect meal. 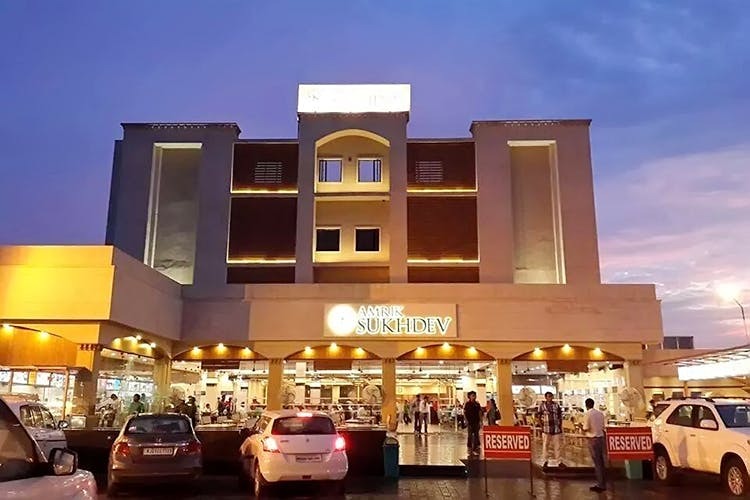 One of the most popular spots, Sukhdev attracts customers from the city on an almost daily basis. The 54 year old dhaba serves a range of Indian, Chinese, Continental and South Indian fare. Their specialty? Paranthas. Available with fillings like gobhi, pyaaz and of course the much-loved aloo, these make for the perfect breakfast on a weekend morning. Their Amritsari Kulcha is worth a taste, too. Wash it down with their rich but refreshing badam milk. If you’ve ever driven down to Chandigarh, you know what we’re talking about. Karnal Haveli is a proper restaurant, but the food is typically that of a dhaba. From paranthas and dal makhani, to kadhi and chhole, you can’t go wrong with your order here. They also have a large dedicated area for kids, in case you want to make a road trip with the entire jing bang. This one’s a paradise for meat lovers—from chicken curry, mutton curry, and keema kaleji to an array of kebabs paired with their fresh rotis and paranthas. The kadhi chawal is a hit amongst the vegetarians. A typical Rajasthani restaurant in Sonipat, drive here for the excellent daal baati churma, moong dal halwa, Rajasthani kadhi and besan gatta. They also offer a bunch of recreational activities such as skill games, tonga rides and henna application.